The skin reveals have begun. Blizzard previewed the first of nine new skins coming to Overwatch for the Storm Rising event, and Baptiste is the first of the bunch to have a skin revealed. 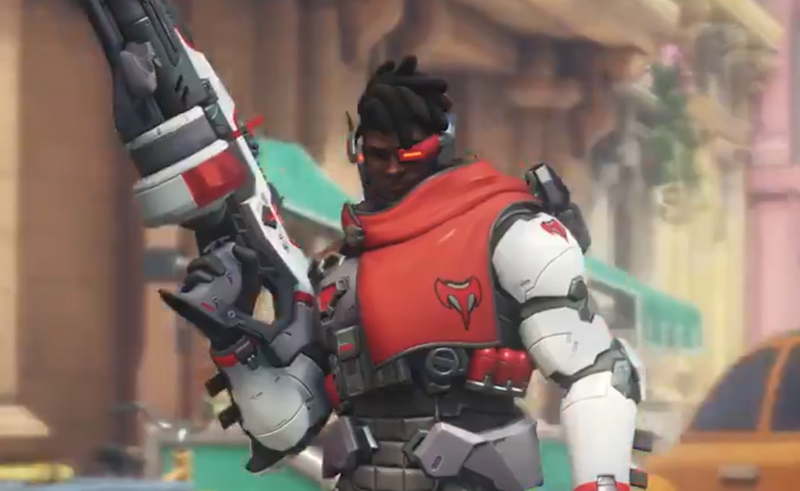 Named Talon Baptiste, the new legendary skin gives fans an insight into what a younger Baptiste looked like during his days as a Talon operative. The combat medic is dressed in red and out outfit with Talon logos imprinted on his chest and gun. Talon Baptiste first appeared in the hero’s origin story prior to his release. Orphaned by the Omnic war, Baptiste turns to Talon as a way to make end’s meet. The combat medic realizes his mistake, however, and leaves the organization to help those in need of aid. Blizzard revealed nine new skin slots on the event’s home page and eight of the event’s achievements yesterday. One of the achievements previewed the Talon Baptiste and additional skins for Ashe, McCree, and what seems to be Bastion. Storm Rising will kick off on April 16 and features a new story mode where players will play as either Tracer, Mercy, Winston, or Genji as they pursue Maximilien, a Talon operative. Players will have to work together to extract the omnic from his Cuban hideout before the clock runs out.